If you liked our Shamrock brooch last St. Patrick’s day, we’re stepping it up a notch this year. 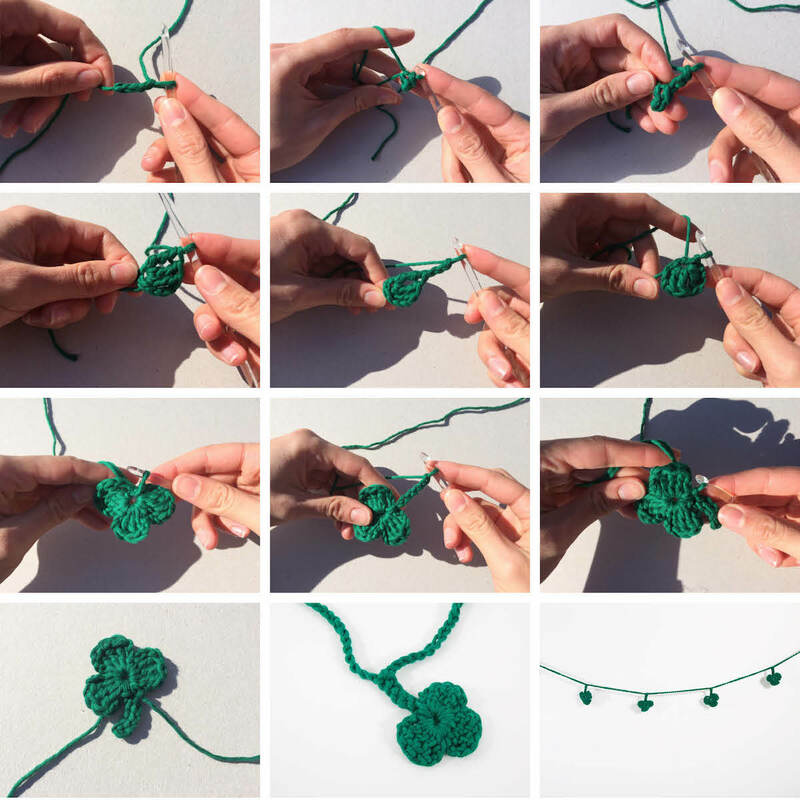 Today, we’ll walk you through how to crochet a shamrock garland – it’s super easy! So decorate your space, wear it as a necklace…the options are endless! 1 ball of Shiny Happy Cotton (we used Land of Oz) – you won’t use a whole ball! Step 1: First thing’s first, you’ve got to make a handful of shamrocks. We crocheted up 12 for our garland, but you can make more or less depending on the length you’d like. 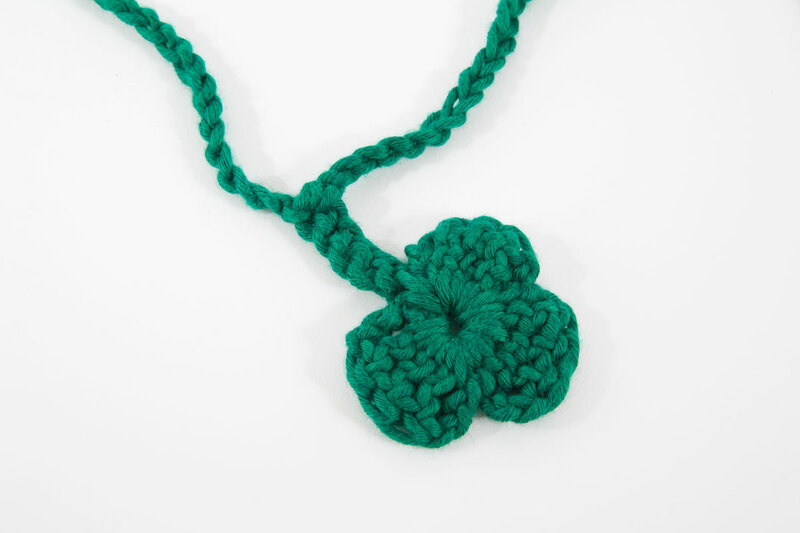 Learn the basics of crocheting your shamrocks here. Step 2: Now that you’ve got your shamrocks, it’s ready to bring it all together. Make a slip knot in your yarn. Step 3: Make 20 chain stitches (learn how to master this stitch with our tutorial). Step 4: Insert the hook into the end of the shamrock stem. 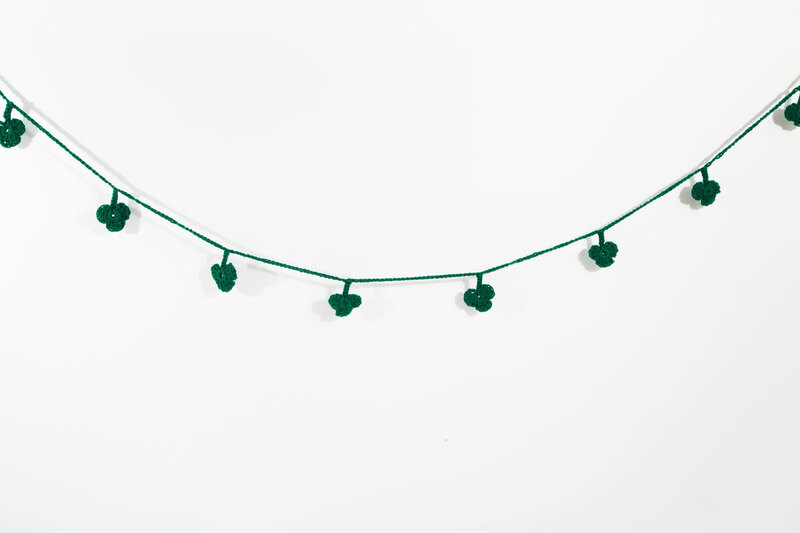 Then make a slip stitch to secure the chain to your first shamrock. Step 5: Make 30 chain stitches. Step 6: Repeat steps 4 and 5 until you have 1 Shamrock left to join. Step 7: You’re almost there! Insert the hook into the end of the last Shamrock stem, make a slip stitch to secure the chain to the Shamrock. Step 8: Make 20 chain stitches. Cut the yarn and pull it through the stitch on your hook. Step 9: Weave the ends in at each end of the chain, then tie a knot in each end. This hides the yarn tail and weighs down the ends of the garland. You couldn’t be more ready for St. Patrick’s Day now! Don’t forget to let us know how your garlands go in the comments.